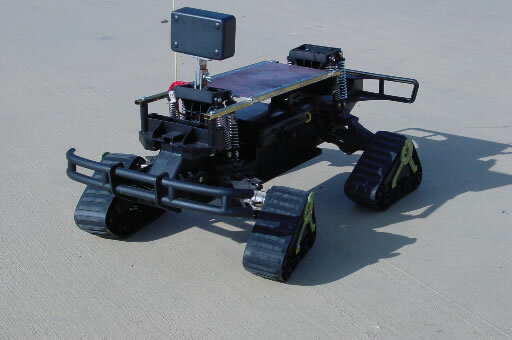 Here are a few pictures of a remote-controlled rover project I'm working on. 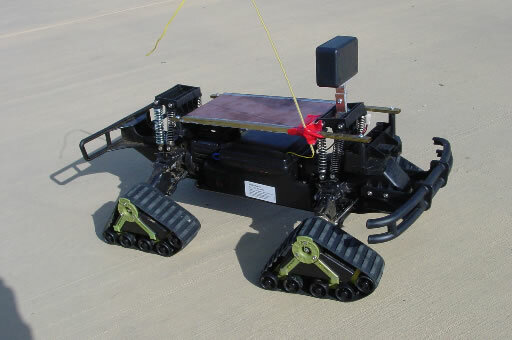 The rover base vehicle is from a Radio Shack F-350 Mattracks R/C car that was sold for the 2004 Christmas season. I picked one up and removed the very ugly green F-350 body. The remaining chassis looks pretty good for a robot because it has the Mattracks instead of wheels. I've added a project box to mount a video camera. The base is built from PC board material. I made the top section in a T shape and the bottom has two pieces with a bolt to hold the sandwich together. I used small pieces of L shape brass to support the parts, and soldered them together with a huge old soldering iron. I next built a platform for additional equipment. This is held on with two rails of rectanglular brass tubing. These are attached with four bolts at the corner mounts that previously held the plastic body. The main part of the platform is copper clad PC board. This was attached to the rails by soldering L shaped brass strips along each side. 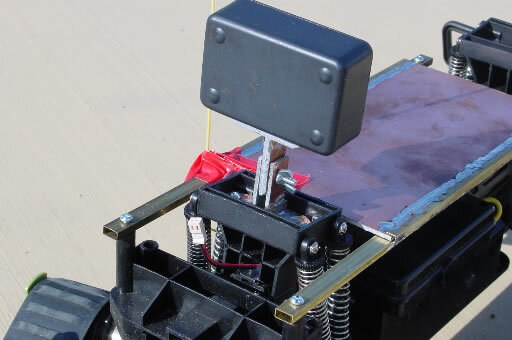 The R/C reciever antenna is currently taped to the side of the equipment platform and needs a stronger mount. Here are some of the components that I need to add next. 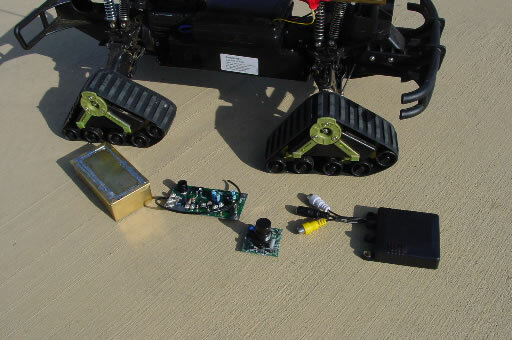 On the right is a 2.4 ghz video transmitter. I haven't tried this out yet. Adjacent is the video camera board which will be mounted in the project box on top of the front shock tower. On the left is a 430 mhz ham radio TV transmitter, which I will probably use instead of the other unit. This is a 1 watt board that should have much better range than the 2.4 ghz unit. On the far left is a brass box I'm building to enclose the TV transmitter. With multiple radios, they all need good sheidling and protection to prevent overloading. The normal R/C reciever under the platform will probably require shielding to prevent the TV transmitter from wiping it out. This is a rear view with the TV project box set on the equipment platform. I'm not sure where I'll mount it, but the box needs a switch plus power, switch, video in and antenna out connectors. I also need to build and mount a small antenna. In this shot you can see the replacement shock springs I added. I tried a few springs I found at the hardware store and added some stiffness to the suspension. The unit doesn't steer well if there's much weight and the suspension is pushed down. I replaced one spring at each shock, which probably messes up the spring balance, but it didn't seem to need two stiffer springs at every point.